Flapper pie is a long, long time family favorite of my mother’s, mainly because it’s her favorite pie on earth. My mom doesn’t have much of a sweet tooth- I inherited my sweet tooth from my dad- but a few years back my sister discovered that my mom loves a piece of flapper pie above all else. When you read the title of my newest pie recipe for pie day, you’re most likely going to be in one of two camps. I’ll give a small percentage of you the chance of falling into the rare category of “Ooh, that’s a family favorite!” My mom was in seventh heaven when she found it in a small cafe around Pine Lake Alberta and made sure to visit whenever her and my dad went out to the lake for the weekend. 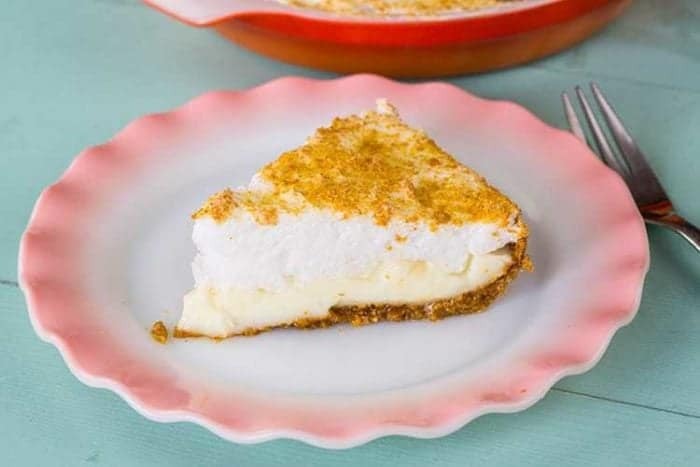 Flapper pie is a graham crumb crust pie filled with a decadent, creamy custard filling topped with a meringue. It’s so unique to the prairies that if you didn’t grow up here you most likely haven’t ever heard of it. 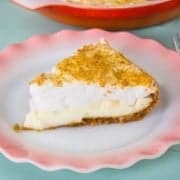 Indeed, perhaps not many Albertans have heard of flapper pie, this is a Manitoba recipe straight from the family archives, one that would have been passed around the farms! Flapper pie seems to have been popular with my grandma’s generation……then just plainly died out. My mom never made it. I never had it at my friends houses. 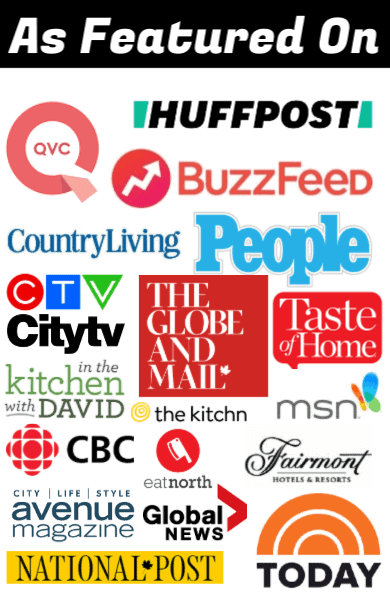 When I asked around, so few people have heard of it. Even fewer have ever baked it! 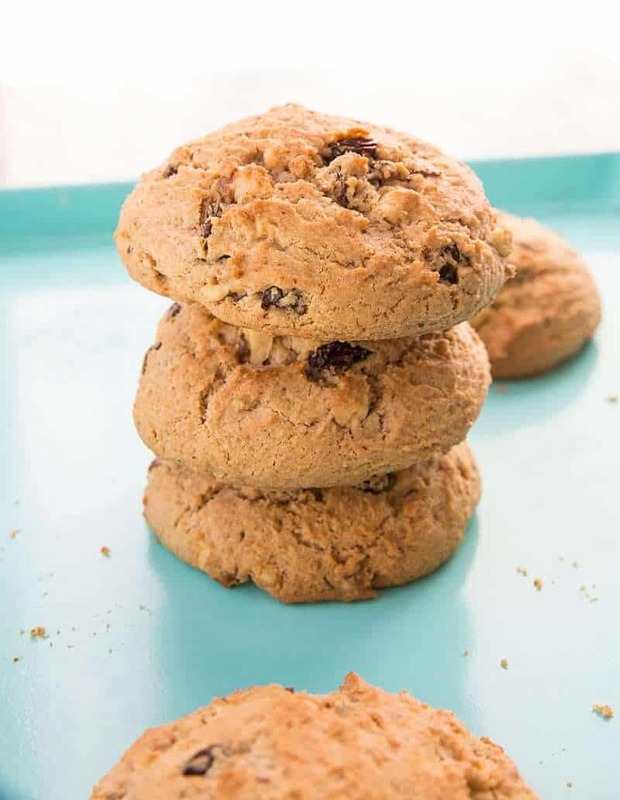 What once was a staple in prairie kitchens is now a rarity to find, unless you are lucky enough to still find an older generation baking it in their cafe or restaurant, such as the one in Pine Lake. I don’t ever recall having flapper pie, so even though this is something my mom grew up loving it’s not something we had as kids. My mom isn’t a pie baker, that fell to my grandma and now apparently I’ve taken up the baking mitts and am carrying on the tradition. 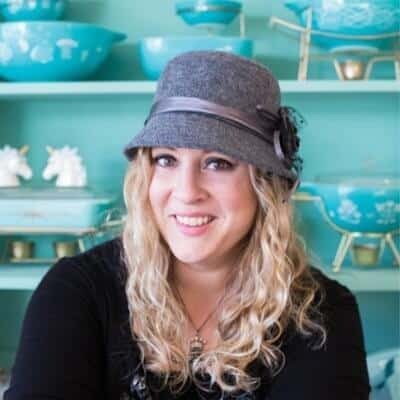 If you read last week’s pie day post – Drunken Peach Galette – you’ll know that I spent the week at my sisters. What you also might know if you follow me on Instagram is that my sister and I were up at 9 am baking pies one morning. This is what Ukrainian women do. We get up. We bake pies. Sometimes in pajamas. My sister was totally in her pajamas. I have no pictures because I value my life. Flapper pie is notorious for being delicious and falling apart easily. It’s very hard to nail it so that it stays together, so be prepared that it won’ t be picture perfect. 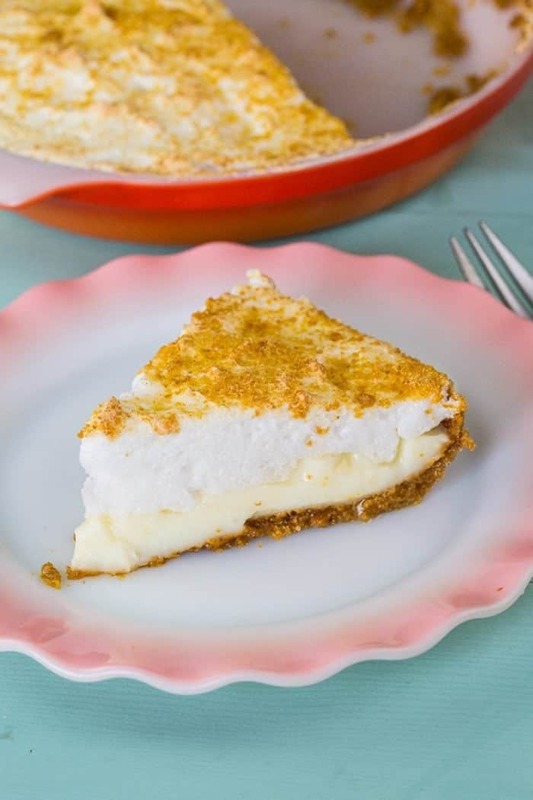 Using butter in the crust will help solidify it when refrigerated but really, custard and meringue? You know it’s not going to be a clean slice. Mix all the crust ingredients together, save about 2 tbsp to the side and press the rest into a 10 inch pie plate, in the bottom and up the sides. Refrigerate. Combine the filling ingredients together and cook on a medium heat until it boils and thickens, making sure to stir constantly! Set aside to cool while you make the meringue. Beat the meringue ingredients together until they form stiff peaks. Pour the filling into the crust and top with the meringue, making beautiful little spikes that will brown up all lovely on top! Sprinkle the rest of the crumbs on the top and slide into a 350 degree oven. Bake until the meringue browns like below, around 10 minutes but watch it carefully! All ovens are different! Cool in the fridge and eat the same day. This isn’t a pie that is going to last a few days, meringue topped pies get slimy between the layers. This is best made mere hours before serving. Now, you can see below that you can get a clean slice. Unless you are my sister and I and eat it warm out of the oven because when you do, it will collapse. We wanted that pie. For breakfast. This was the best Saturday morning breakfast I have ever had. I highly suggest to everyone that you put “eat flapper pie straight from the oven for breakfast” on your bucket lists. What I have been missing all my life! This is definitely a favorite pie now, I’m not sure how or why everything comes together to make such a great pie. 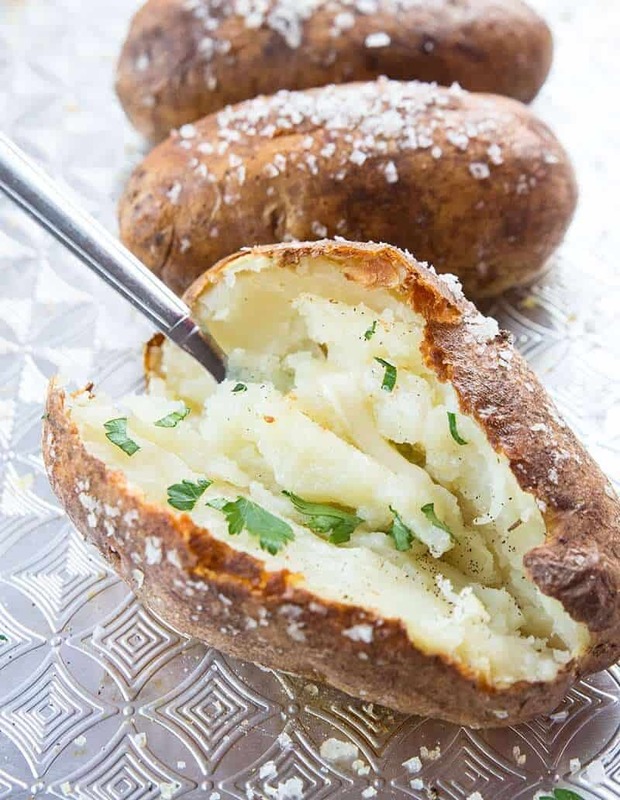 It’s simple, it’s easy, it’s so darn tasty! Happy Pie Day everyone! I really hope you all try this recipe, what a truly lost prairie pie this is and I really don’t understand why! It’s so simple yet decadent. If nothing else, add it to your archives to try one day and pass it on to your kids! I know I will be including this at family meals a lot know, knowing it’s a childhood favorite of my mom’s. Flapper pie is a graham crumb crust pie filled with a decadent, creamy custard filling topped with a meringue. It's so unique to the prairies that if you didn't grow up here you most likely haven't ever heard of it. Thanks for the recipe. 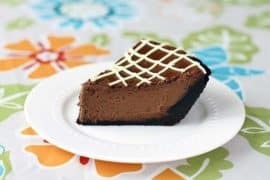 I have been searching for a recipe for the “boston cream pie” many prairie chinese restaurants in the 1960-70’s used to serve. No chocolate, but a white custard, pie pastry, whipped topping with a tiny piece of red and green jello as garnish. If anyone has this recipe please let me know! My Mom was born & raised in Southern Alberta-Flapper pie has been in my family since I was a kid-I am 62 years young now- I know one of Mom”s fp recipe came off a box of IBC Graham wafers-White with pink box.Thankfully I have found a place near The Hat that serves it. Plus I remember when the family moved from Calgary to Edmonton there were some adjustments needed due to altitude change. Thank heavens it is Flapper Pie Friday at Trukkers in Redcliff Alberta this Friday–Pie for breakfast. My mom always added Almond extract to her flapper pie filling, and to the meringe. She used to make this pie for my kids. They always told her she needed more practice so she would go home and make them more pie. Now I make it. We love Flapper Pie. My pies are wheeping. Would you happen to know why? I am 68. Flapper Pie is still my favourite pie! Mom always made it when we were kids. Now one of my sisters makes it. And yes, who cares if it falls apart! It is so delicious! Rarely do I find people who have heard of flapper pie, let alone have eaten one. They don’t know what they’re missing! 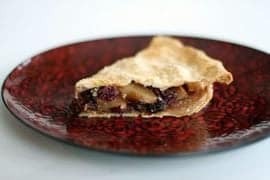 If my sister is reading this – isn’t it time you made a flapper pie? ???? My boyfriend’s dad asked for flapper pie for Father’s Day last year. I didn’t even know what it was, but I found this recipe and made it for him. He raved about it, saying that he hadn’t had flapper pie that good since his grandmother made it for him (who had passed away 20 years ago). Made it numerous times since then, it’s delicious! Thanks for posting, I grew up on this pie! I remember having friends over & my mother making us each a pie that we’d eat in one sitting, it was that good! My mom passed away about 10 yrs ago & I had forgotten about this pie. I will be making this soon! Northern Alberta favourite! Very sorry about your mothers passing i guess she was very strong to have lived such a long life. We just lost my mother-in-law last fall, she was born on the prairies . She lived 81, but had been a very healthy strong woman (she would have lived much longer except the Parkinsons she developed meant lots of falls and those injuries shortened her life considerably we think.). 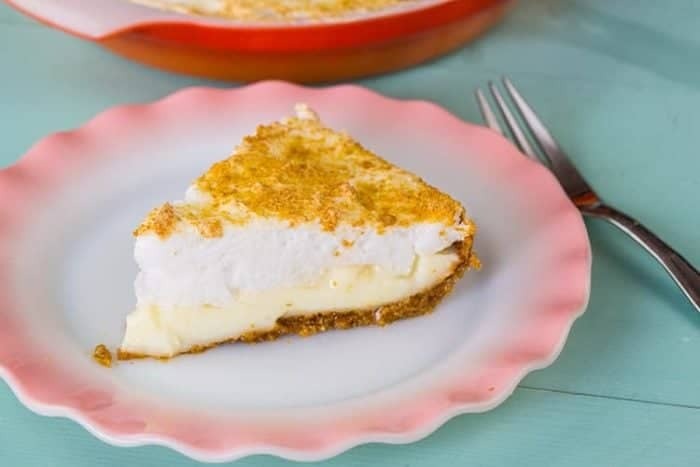 Anyway regarding pies – every since I met my husband many years ago he always like to have “graham wafer pie” which he showed me howto make with Jello vanilla pudding, on top of a graham wafer crust (no topping) when he was a bachelor. I had never had this desert before (I am from the BC coast). Anyway his grandparents and his parents were from Saskatchewan! I think this “flapper pie” probably explains it all to me now! Obviously the pie was made from scratch back then, and he had been served something similar by his mother while growing up in Vancouver, and likely by his grandma when he was sebt to Sask as a youngster for several summers to stay/help on the farm. I am not sure why he never mentioned about the meringue except that maybe as a bachelor he didnt understand how to make that part so left it out. Cheers and peace to you as well. Do you substitute brown sugar in the crust or in the pudding part? Sobey’s in Airdrie has flapper pie in their bakery!!!! Mmmmm- instead of merengue topping they use whipped, not sure how authentic that is, but it’s sure yummy! Oh but you are so missing out on the flavour! Oh yes, you need that cinnamon! 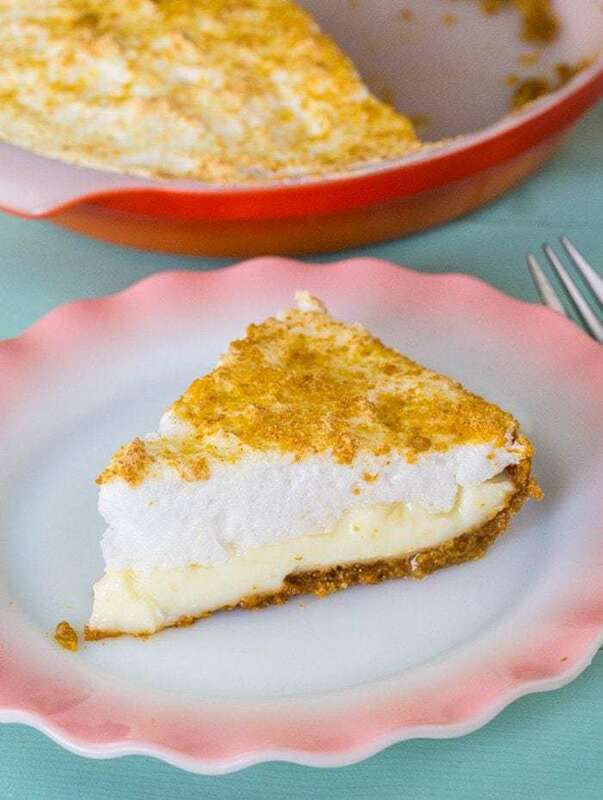 My mom made Flapper Pie all the time in the 70’s, one of my favorites. I am going to introduce it to my grown sons, they will hopefully love it. I don’t think I ever made it. Grew up in south eastern Alberta. Thank you for posting the recipe. I am so glad that you found this! I am sure your sons will love it, everyone loves this pie! What a wonderful memory to share with them too! thank you, thank you….my Aunt Erna made this pie and passed away before i could get the recipe. I’m sorry to hear of her passing, I hope the recipe is close to hers!